Experimental saxophone quartet Battle Trance pushes the capabilities of both the tenor saxophone and the human breath on Blade of Love. There is one core question at the heart of the Battle Trance project: just how much can a tenor saxophone accomplish sonically? Brooklyn-based saxophonist and composer Travis Laplante must have thought the instrument infinitely capable when he brought together, as if by divine revelation, the three other saxophonists with whom he performs as Battle Trance. These four men--Laplante, Patrick Breiner, Matt Nelson, and Jeremy Viner--came together on 2014's Palace of Wind, already one of the great avant-garde albums of the decade. On that album, Battle Trance takes a single instrument and wrings out from it an almost impossible cornucopia of sounds. Parts of Palace of Wind sound like crisp winter wind gliding over icy tundra. Some of it brings to mind a Victorian gothic, a distant church bell ringing against an ominous grey sky. Writing in PopMatters' Best Albums of 2014 list, Nathan Stevens writes, "There’s a section late in Palace of Wind that sounds like thousands of birds ruffling their feathers, getting ready to take off into the sky." Film composers usually require a whole orchestra to evoke these images sonically. Battle Trance does it with a single kind of instrument, played by just four people. Palace of Wind is an entity unto itself. The idea of a tenor saxophone quartet will not come intuitively to most, which makes the album's aural richness all the more surprising. It was not mere promotional fluff that the alblum was described in its press materials as "existing in the cracks between contemporary classical music, avant-garde jazz, black metal, ambient, and world music." Despite a single instrument forming the entire compositional foundation for Palace of Wind's music, Battle Trance was able to create not just a sonic landscape, but a sonic world. Guitars, by comparison, would likely require numerous effects plugins and pedals in order to replicate the vibrant colors of the album. Laplante describes Blade of Love, Battle Trance's second album, in similarly superabundant terms. "It's painful for me to try to explain what this music 'means,' because in a sense it has no meaning--and at the same time, it means everything." Everything and nothing: such is Battle Trance's approach to music. The quartet's music inspires so many adjectives and superlatives that it renders any of them worthless. This is probably why Laplante also says of the new record, "I just hope Blade of Love will release something in both the listener and the performer's hearts. It doesn't ask for anything in return." There's a viscerality and immediacy to Battle Trance that words cannot capture. This kind of music, which is so much itself and like little else, creates a challenge for the artists that perform it. In PopMatters's Best Hopes to Break Out in 2015, I argue that Palace of Wind is as much an obstacle as it is an achievement for Battle Trance. Because that album is one-of-a-kind, it sets a high bar for Battle Trance to vault. When one further factors in the (seeming) limitation inherent to a single instrument -- even one played by four different people -- another question important to Battle Trance's existence arises: "After Palace of Wind, where can these guys go?" If Blade of Love is any indication, there's still plenty of sonic space for Battle Trance to explore. Like its predecessor, Blade of Love is a vast canvas consisting of a range of brushstrokes, from long, elegant streaks to erratic, Pollock-esque flecks. The abstract art that makes up the album's sleeve art is not incidental to the sounds its represents. The album evokes so many images that they all meld together and form contorted yet beautiful shapes. Structurally, Blade of Love picks up right where Palace of Wind left off: the LP consists of one eponymous piece broken up into three movements, each one longer than ten minutes. Blade of Love revisits some of the textures explored on the previous record. The quartet's top-notch circular breathing provides staggering energy to the passages where all four saxophones are spitting out 200 notes a minute. There are long, airy stretches where reedy notes blanket atop each other like vocals on a Beach Boys album, luxuriating in their interplay. There's more than enough on Blade of Love to evince that Battle Trance is looking to build on the success of its first album, rather than throw out the playbook all together. This smart approach is what helps make the newly explored territory all the more striking. Palace of Wind tests how far the tenor saxophone can go; Blade of Love tests the limits of that instrument and the human breath. There are plenty of sonorous notes on this record, but they are peppered with what sound like spits, coughs, and smacks into the mouthpiece of the saxophones. 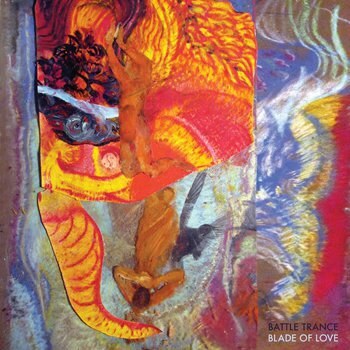 "Blade of Love II" opens with what sounds like horror movie ambient noise, after which the members of Battle Trance perform what sounds like CPR on their instruments. The latter half of "Blade of Love III" sounds like whispers from the beyond. Blade of Love stresses the continuity between the human and the instrument, the breath and the notes it gives life to. These compositional insights are further augmented by some of the quartet's best composition yet. Though Blade of Love and Palace of Wind are best taken as cohesive wholes, "Blade of Love I" is the strongest and most polychromatic piece this outfit has written thus far. At 16 minutes, it's a musical marathon for the listener and the players, but by the time it comes to its gut-punching conclusion, it will all be worth it. To hear the song transition from a gorgeous, almost poppy mid-section to a finale that brings to mind the skronks of heavy metal bands like Shining, is to be reminded that in the right hands, music never loses its capacity for surprise. "Blade of Love 1" is a journey from an overcast morning to a frolick through a sun-drenched tulip field to the gates of hell. And once it's done, there are still two movements to go. There are enough similarities between Palace of Wind and Blade of Love that the underlying challenge of Battle Trance's identity remains: just how far can these four guys take a single instrument? The answer remains to be seen and heard, but for now all signs point toward more innovation. Rarely has the economy of instrumentation and composition been used to such compelling effect as it is on Blade of Love.